Re: LoL 3e: More Champs! Udyr, Maokai, and Nunu! Heh, I tried my hand in building my favourite(-est) character in the game. I don't know why she came out so cheap (and her Etwahl isn't even easily removable) but I think the build in general has enough of "me" in it so I feel I've done her justice in that aspect. disability: Sona is described as "soundless" and cannot speak. fame: she's an accomplished muscian. 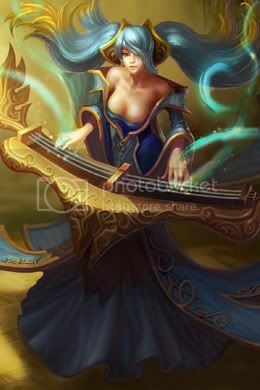 -I present you- Sona the Maven of the Strings! She's from the League of Legends the game. She came out a LOT cheaper than I estimated and I'm keep expecting to have a major calculation mistake to pop up anytime soon... But as now, one can happily remove the Removable flaw (heh) and up her Parry score to the PL-appropriate level to use up most of the spare points. -the main problem with the Song of Celerity is that chasing (and by extension movement speed) doesn't tend to play as major a role in M&M as it does in LoL. It means that unless under truly exceptional circumstances, no player would choose to activate an Affects Others Speed effect instead of other more combat-oriented effects within the same array. However, the movement speed in LoL not only provides the obvious advantage in pursuit scenes, it also translates to a better unit control in general and a chance to avoid AoE effects by moving out of its range. So instead of making this skill a literal translation of the ingame uses, I decided to use my personal interpretation of the effect by making it an enhanced Acrobatics effect with Agile Feint, to show how people can easily outmanoeuvre the enemy teams into more advantageous positions (for the team). -I don't care if the third rank of Attractive isn't covered by the book. -I've never been a big fan of complex builds and I think this Sona build is about as complex as I'd ever get with my builds with all those extras and flaws smeared all over the powers.